Sprinkle with baking soda, scrub with a damp sponge and all of your soap scum troubles will be gone! Need something with a little more zip? Add coarse salt and crank up the elbow grease and nothing can stop you from a good, green clean. The natural acid in lemon juice and vinegar will destroy any lingering mildew: spray or soak with the acid of your choice then scrub with a stiff brush or the rough side of a sponge. You remember that elementary school science experiment: add vinegar to baking soda and an instant reaction! Foaming, bubbling, spitting - the mixture goes wild until all of the fuel is gone. Now, imagine having an excuse to do that every day... But really, if a drain is being slow or is clogged, pour 1/2 cup of baking soda into the sink/shower, followed by 1/2 cup of white vinegar - if this is the shower, try to pour slowly down the drain and contain the reaction with a cup - forcing the effervescent process down the drain to destroy the clog. Be sure to rinse well with at least a quart of boiling water. 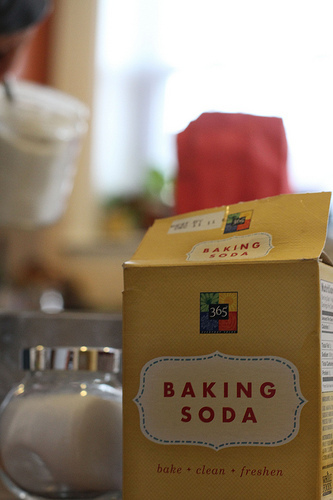 Sprinkle your counters with baking soda and scrub with a moist sponge! Stains? Simply mix baking soda and water into a paste and apply liberally, allow the mixture to sit for a few minutes before scrubbing away. This also works well on stainless steel sinks or bowls and cutting boards - deodorizing as you clean! Line your sink or a deep pan with foil, fill with enough warm water to cover your pieces (an inch or two) and add 1 Tablespoon of baking soda, stirring well to dissolve. Add your silver and allow the pieces to soak for ten minutes, then voila! Rinse the silverware in warm water and allow to air dry on a clean, soft cloth. One of my earliest kitchen chores used to be polishing my mother's copper-bottomed pots - I would cover the bottom with coarse salt and then sprinkle with lemon juice and gently scrub the discoloration away with my fingers. Incredibly effective for both polishing your pots and pans and discovering any microscopic cuts or scrapes. Maybe substitute a scrub brush or sponge. While I discovered that coffee filters are about 10x more effective than paper towels when it comes to cleaning glass, using newspapers was a first - and there will be no going back! Whether you use vinegar and water (2 Tablespoons vinegar to every gallon of water, fill a spray bottle and you're ready to go) or a commercially available spray, using recycled newspapers leaves a streak free shine you can see and hear (you'll quickly understand what they mean by "squeaky clean"...) Not into the harsh vinegar smell? Try lemon juice in the same proportion. 3. Deodorize Your Carpets Sparingly sprinkle 1 cup of baking soda across the carpet of a moderately sized room; allow to stand for half an hour then vacuum it all up. Much cheaper, more effective and safer than those aerosol fragrance sprays. To remove tough stains from delicate linens without damaging the fabric or an expensive trip to the dry cleaners, try simply using boiling water. Bring a quart of water to a boil (I prefer using a tea kettle for easy pour-ability). Drape stained area of the linens over a pot or cup in the sink, or have a stalwart partner help you hold the material somewhat taught. Pour the steaming liquid over the stain (the higher you can be and still remain accurate, the better - gravity helps) until it disappears! The hot water causes the fibers to relax and allows the stain to simply drip away into the sink/pot/bucket below. No need for bleach or a certain disinfectant spray. Combine 1 quart of water, 1/2 cup of liquid dish soap and 2 Tablespoons of tea tree oil - all natural and completely safe for kids and pets. Great tips! Crocheting acrylic yarn to cover the Swiffer mop eliminates more disposible cleaning tools. I love cleaning with baking soda, vinegar and lemon juice. They are really helpful and healthy. Thanks for these great tips and regards.